Mark Twain: Even though famous American writer Mark Twain (born Samuel Clemens) wasn’t exactly a psychic, the author did predict two things correctly. 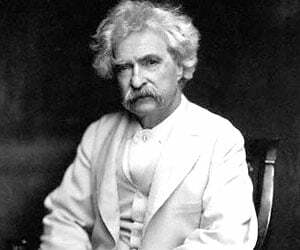 Twain claimed to have foreseen his brother’s death in a prophetic dream, where his brother laid in a coffin resting between two chair at their sister’s home. His brother was killed weeks later in a boating accident and the funeral was arranged in the exact same way as his dream, which he had not told his sister about. Secondly, he predicted his own death in 1910: he was born in 1835 when Halley’s Comet was visible and correctly said he would die the same year it would reappear – 1910.